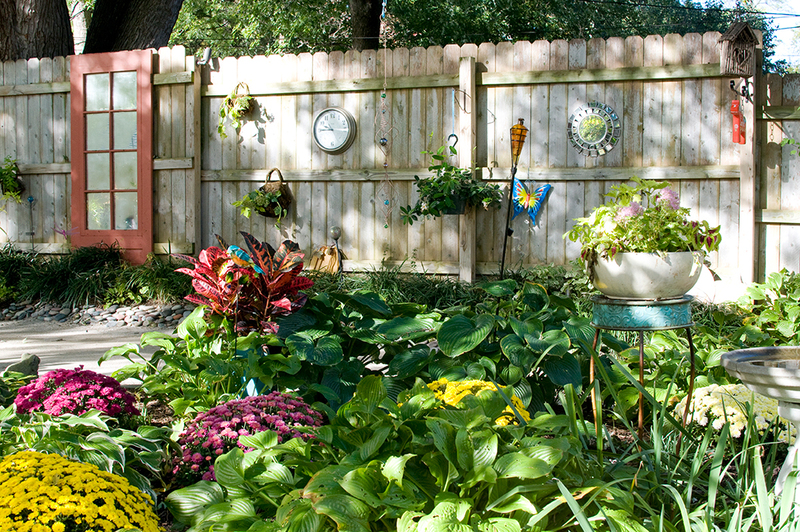 Dr. Deb Carlin revels in each and every season in her eclectic University City garden. Just approaching Dr. Deb Carlin’s front door is a treat. Stroll along the walk and you encounter a planter overflowing with greenery that looks just like a red-rubber boot. Step a few more feet and encounter a colorful glass bauble reflecting light. In the autumn watch for pumpkins and squash tucked in among the plants. At the festive front porch seasonal ribbons twine their way through the wrought-iron railings and pumpkins, squash and mums cascade down the steps. Deb Carlin is in the business of helping people get the most out of their lives. A psychologist, author and motivational speaker, her book “Build the Strength from Within” and subtitled “Create the Blueprint for Your Best Life Yet,” is written to help individuals find joy and be the best they can be in all phases of their lives. Her company Partners in Excellence works with businesses and organizations to help employees and members concentrate on their attitudes and perceptions to help them gain clarity and perform at their peak. 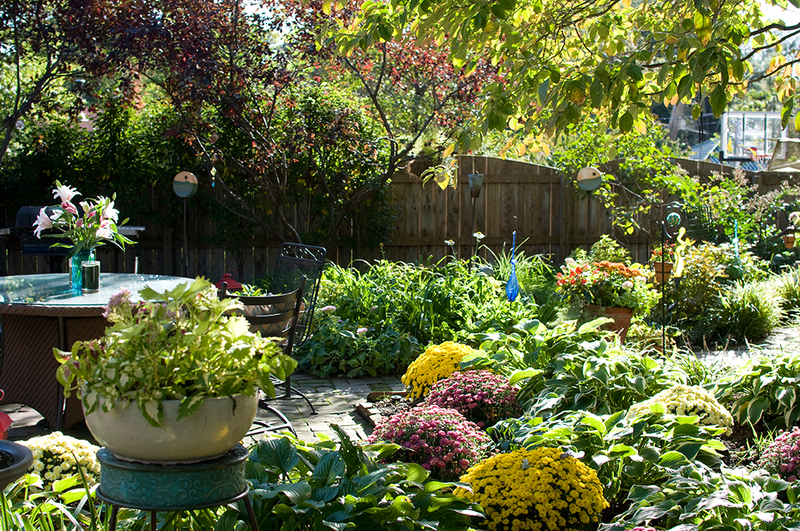 An author who practices what she preaches, Deb uses her University City garden to build her own strength and find joy. It is hard for her to remember a time when she wasn’t interested in gardening. Growing up in Chicago with parents who liked and appreciated being outside, she recalls lilacs and long lines of tulips welcoming spring and roses throughout the summer. In her own life, she sees gardening as a way of staying balanced. Noting that most of us today are insulated, isolated and “hermetically sealed in apartments, condos and homes,” gardening is “about being outdoors and getting sweaty and dirty,” she explains with a laugh. Her garden, she adds, “grounds me, and it is amazing how much joy it brings to other people. “Every month, every season, there is something to celebrate,” she emphasizes. Rather than looking at fall and the coming winter as depressing, Deb sees “autumn as a beautiful change of color” as her garden shifts from the bright colors of summer to the muted orange and golds of fall. “I plant mums and bring in pumpkins and squash that are beautiful but also edible. It’s a time to harvest and dry herbs.” Rather than leaves falling, she likes to think of trees as “letting go of their leaves, standing tall and resting so they can replenish themselves in the quiet of winter and be productive in the next season." When winter comes officially on Dec. 21, Deb celebrates the winter solstice by inviting friends to a luminaria with candles lighting her front walk. “When they get up to the front door, they see the (inside) staircase lit by candles and the 100 percent of the house lit by candles. They always come in and relax,” she says. 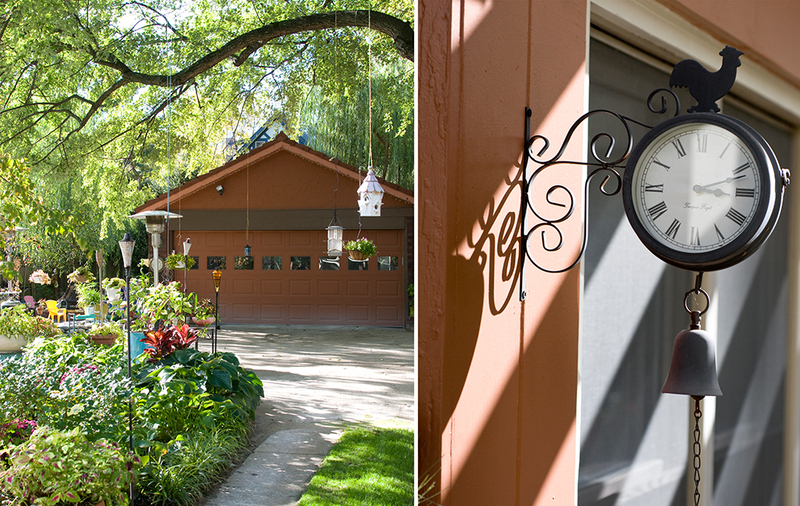 When she moved into her house more than 20 years ago, Deb recalls having an immediate vision of what the yard could become. “There was an old, plastic greenhouse and a barbeque pit that I got rid of,” she recalls. In place of those relics, she planted 47 trees, 11 of them dogwoods, that “provide shade, flowers and fruit. In spring the garden looks like an Impressionist painting. “ In addition, she erected a wood privacy fence that she now uses as a “blank canvas” on which to hang a variety of decorative items. Particularly prominent is a large melon-colored door with mirrors where there would normally be glass. “Then you look at it, it appears to be a pathway to another garden….and it is…a garden of the imagination,” Deb explains. Favorite plants include her big blue hostas with their fragrant blossoms and the sweet-smelling Miss Kim lilac planted next to the deck. From the deck on the back of the house to the pathways and different seating areas throughout the garden, there are whimsical and beautiful objects to admire. “Some of the things have been with me my entire life,” she says. Many are gifts from friends; others are spur of the moment purchases. 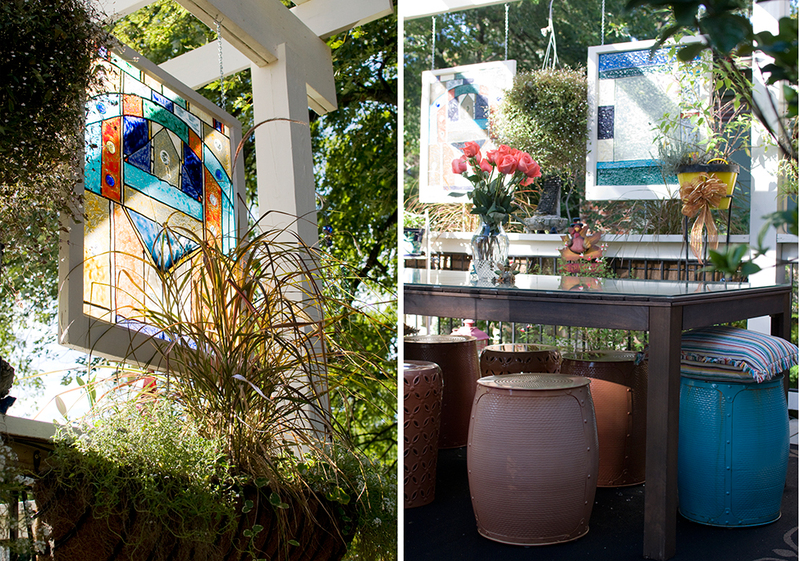 One of her favorite places to shop is Garden Heights nursery in Richmond Heights. “The joke there is how many things can I get in my car when I am ready to leave,” Deb says with a laugh. 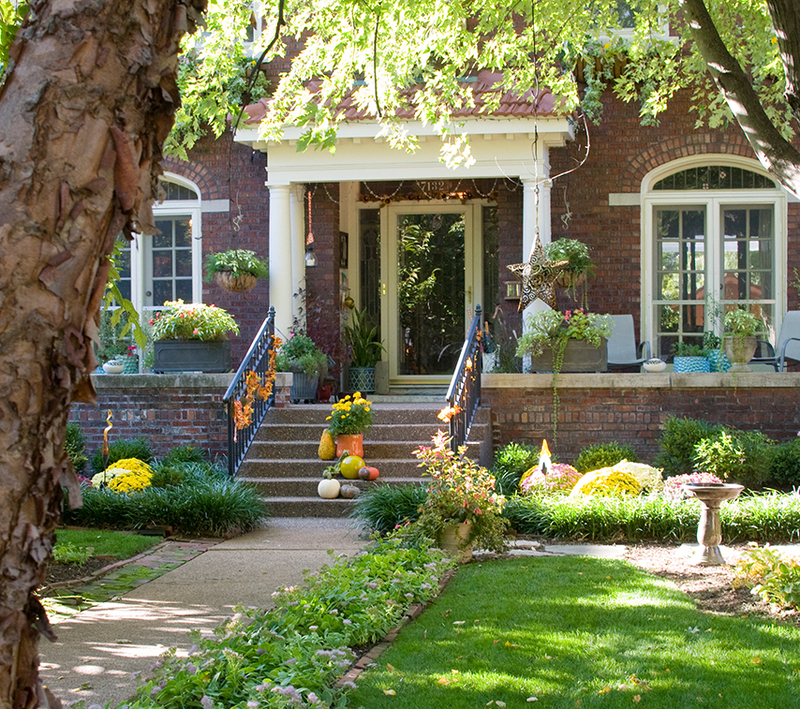 While Deb does much of the work in the garden herself, she also relies on Ron Goedeker of Landscape St. Louis for the literal heavy lifting. People look at her garden and are often overwhelmed at the work it takes to keep it up, Deb notes. But she sees the work in terms of rewards….”watching the beautiful birds and talking to the crazy squirrels."